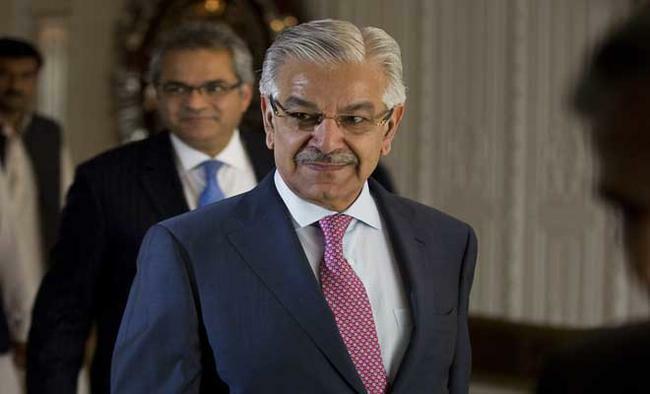 New York: Pakistan's Foreign Minister Khwaja Muhammad Asif has claimed that an offer was received to swap Indian prisoner Kulbhushan Jadhav for a terrorist behind the Peshawar army school attack in 2014, who, he asserted, was now in Afghanistan's custody. "The terrorist who killed children in APS (Army Public School in) Peshawar is in Aghan custody. The NSA told me that we can exchange that terrorist with the terrorist you have, which is Kulbushan Jadhav," he said on Tuesday. Jadhav is a former Indian navy officer who has been sentenced to death by a Pakistani military court for allegedly spying for India within Pakistan.New Delhi has denied that Jadhav was working for India and has appealed to the International Court of Justice to stop the death sentence. Asif, who was answering questions after a speech at the Asia Society here, did not specify which NSA he was referring to and did not expand the initials. From that vague reference, it was not clear if Pakistan's National Security Adviser had conveyed the offer or if it was made by an entity or individual in another country sharing the initials NSA.He also did not identify the who the terrorist in Afghanistan's custody was. The Afghanistan government had admitted that the Tehrik-i-Taliban (TTP) Pakistan had safe havens in that country, Asif asserted.The TTP has reportedly claimed responsibility for the attack on the Peshawar army school in 2014 in which 132 children were killed.